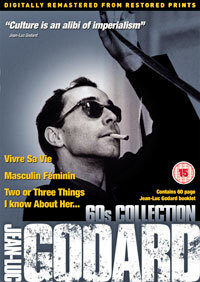 A new DVD collection of Jean-Luc Godard movies hits the shelves in March, but Jean-Luc Godard: 60s Collection probably doesn’t contain the titles you’d expect. By that, I mean it doesn’t include À Bout De Souffle, A Woman Is A Woman, Weekend or Alphaville. Instead, you get Vivre Sa Vie, Masculin Feminin and Two Or Three Things I Know About Her, all digitally remastered from restored prints, as well as an exclusive 60-page booklet – Key Scenes And Dialogue – Jean-Luc Godard. Vivre Sa Vie explores a Parisian woman’s descent into a life of prostitution. Masculin Feminin centres around the relationship between an ex-army recruit, Paul (Jean-Pierre Léaud), and aspiring pop singer, Madeleine (Chantal Goya), while Two Or Three Things I Know About Her (probably the least well-received of the three movies) focuses on Juliette (Marina Vlady), a bored housewife who chooses to supplement her income by spending one day a week in central Paris engaged in prostitution. The three-disc set is available on 26th March 2007 through Nouveaux Pictures, priced around £39.99.